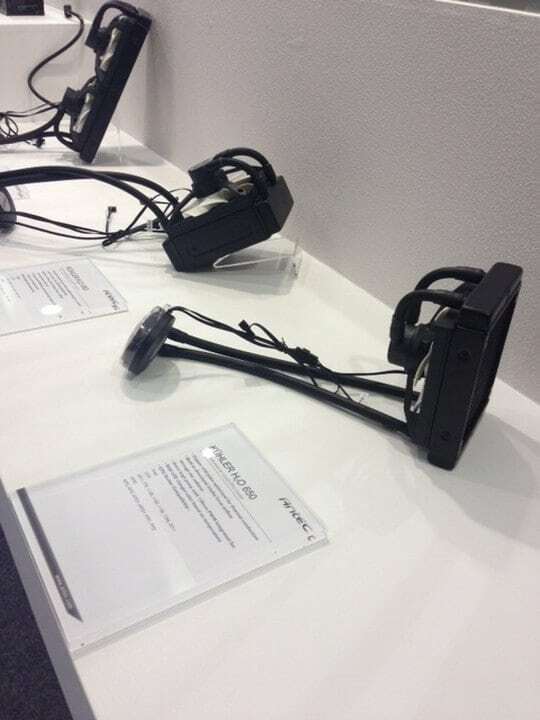 We have seen a number of new things this year at COMPUTEX 2013 and we are not done yet. Antec brought lots of new components to show off including an entire line of redesigned All in One (AiO) liquid cooling solutions. 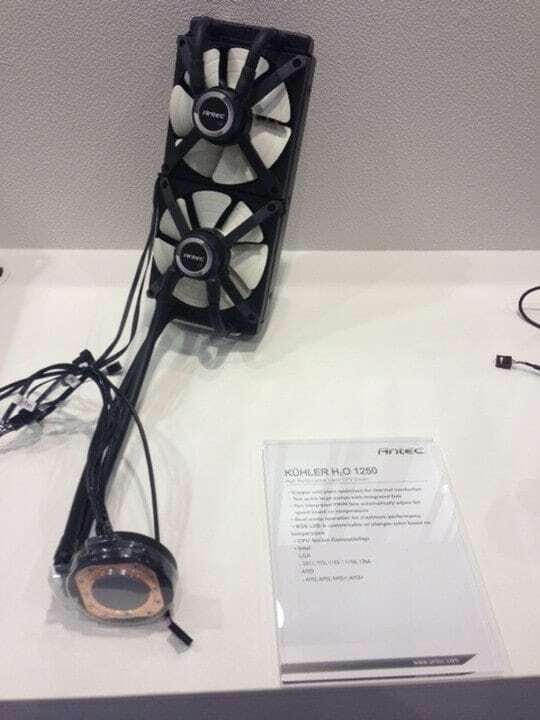 The new Kuhler H2O liquid cooling series has three new models (650, 950, and 1250) and all have some interesting new design ideas. The first thing you may notice different is that fan motor now pulls double duty as the pump motor as well. This radical new design is said to optimize cooling with additional help from the extra-large pump, more powerful fan, and directional diffuser. The 240 mm Antec Kuhler 1250 will feature two of these extra-large pumps to improve flow and cooling dissipation. Antec has also redesigned the universal mounting bracket to work with any AMD or Intel socket. Each of the new Kuhler H2O coolers will fit into a different market place. The Kuhler 650 with temperature controlled RGB LED and integrated firmware for fan speed control will be priced to rival top-tier air coolers. The Kuhler 950 with a more robust radiator (double the height of the 650), two PWN fans, and support for Antec GRID CPU Cooler software will serve as the high performance model in the line-up. The Kuhler 1250 will focus more on either extreme performance and/or quiet operation and as the flagship of the series, will also support the Antec GRID CPU Cooler software. If you are in the market for a liquid cooler come Q3 2013, then you may want to keep an eye out for this series. Prices are not yet available, but Antec has never failed to be competitive with their pricing. Full press release is posted below. June 7, 2013 - Antec, a global leader in high-performance computer enclosures, power supplies, and mobile accessories today announces a radical update to the award winning Kühler H2O liquid cooling series, the new Kühler H2O 650, 950 & 1250. The new Kühler H2O 650 features a complete transformation in architecture and CPU cooling performance. Unlike traditional liquid cooling systems, this self-contained unit comes pre-filled and requires no maintenance. The Kühler H2O 650 uses an extra large pump to circulate more coolant through optimized water channels, while a powerful fan pushes air through directional diffuser and channels it through the radiator for optimal cooling. The Antec liquid CPU cooler has integrated firmware to automatically adjust fan speed and change RGB LED color based on temperature. In addition to class-leading performance, the Kühler H2O 650 includes a newly designed universal mounting bracket that works with either Intel or AMD chipsets to make installation quick and simple. The Kühler H2O 650 CPU cooler takes any PC’s Quiet Computing™ to the next level with liquid cooling performance at a price that rivals even aftermarket air coolers. The new Kühler H2O 950 features a more robust radiator structure with double the height of the 650 for improved heat dissipation as well as two PWM fans, which are controlled by the new user-friendly Antec GRID™ CPU Cooler software. The new Kühler H2O 1250 takes cooling to another dimension by featuring not one but two heat pumps for an extremely fast cooling cycle, thus increasing heat dissipation. In addition to a radiator structure of 240 mm length, the Kühler H2O 1250 is also controlled by the new Antec GRID™ CPU Cooler software. The Kühler H2O 650/950/1250 will be available in Q3.